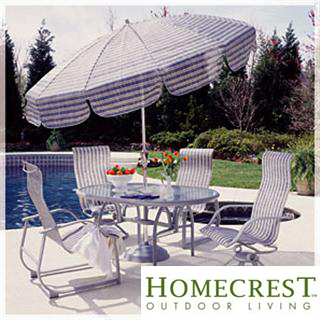 Homecrest offers a comprehensive line of affordable luxury outdoor patio furniture offered in 30 collections. Pieces include tables, chairs, chaises, loveseats, sofas, ottomans bar and balcony stools/chairs stools featuring durable aluminum, steel, and cast frame construction. Products can be customized with an array of frame finish colors and fashionable fabric options. Tabletop options include metal, glass, granite and a broad selection of faux products. Stop in to our showrooms to sit and feel the comfort of Homecrest furniture and view the multitude of options and fabrics available. 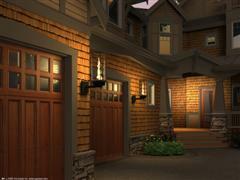 Breaking the barriers of standard torch design, the Tempest Torch is a dramatic outdoor gas lamp. This Tempest Torch creates a natural venturi that causes the flame to spiral and dance without the use of electricity or a fan. Created as an outdoor furnishing for a wide array of exterior settings and applications, the display possibilities are nearly endless: outdoor living spaces, retail or business storefronts, front walkway pillars, mounted onto movable bases or featured on an exterior wall by an entry. Come into our showroom to see this amazing Torch in action! The Tempest Torch Tabletop is a gel fueled version of the Award Winning Tempest Torch. 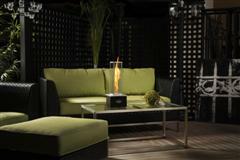 This dramatic accessory creates a great conversation piece for any patio. Affordable & fun, add this to your outdoor entertaining area! Add ambiance to your picnic table, dining table, RV site or wedding. The options to enjoy are unlimited!